In my years flipping cars on Craigslist, I like to think I’ve seen it all. However, each day proves to me again and again that I simply haven’t. With that, I’m going to start sharing some of the more absurd interactions and experiences I’ve had in this business in my new series: Tales of Craigslist. I hope you all enjoy because it only gets weirder from here. You can read this and more on our new site, Fast Not Loud, a site for car enthusiasts who actually do things with cars. Those who may peruse Craigslist as I do on a regular basis may notice the small addendum in each ad towards the bottom that almost every seller seems to add. This wasn’t always the case in the Craigslist atmosphere. In the beginning, those who were in the market that used Craigslist assumed, rightly so, that it was there because that person didn’t want to trade their vehicle in to a dealer. That person put their car on the private market because they wanted to sell it on the private market. Crazy concept. It wasn’t until selling a Honda S2000 two years ago that I began to see the emergence of the Craigslist Trade Offerer, shown below. The trade for a Trans Am wasn’t absurd so much as the notion that forcing it down one’s throat is. However, I am adult so I know how to keep my cool and my emotion in check. This is only one in many trade offers I had received during my time selling the S2000. To my memory, here are the other trade offers I had received within the span of three weeks. -Many, many 350Z’s. Double digits, at least. I’m sure I’m forgetting some, but you get the idea. The notion of paying for an vehicle with dollars is really quite foreign. Overall, I’ve been offered PayPal (a lot), trades, horses, land, motorcycles, some weird buggy, a mobile home, landscaping service and metal sculptures. 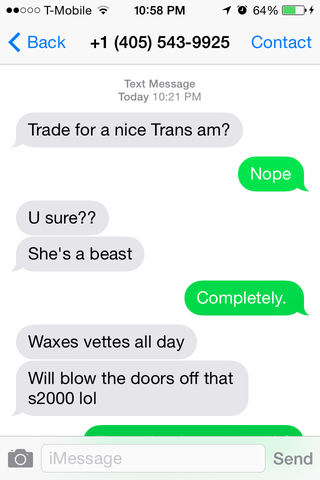 Every once in a while I get that strange person that offers to buy a car with cash. But only sometimes. This may sounds like I’m complaining; I’m really not. This is simply what I have to go through to reach the right person. Selling isn’t easy and these characters are just part of the game. But thanks to the weird, zany, eclectic people of Craigslist, I’ll always be text message entertainment.